AMAZING photo courtesy of Julie! And now for something completely different – a savory recipe! There’s a backstory attached to this post, so I’ll start from the beginning. I discovered Julie of Willow Bird Baking through LiveJournal (yes, that’s still a thing), and at first I just enjoyed her recipes. Then, I realized that she lives near me! I immediately emailed her and asked if she would be interested in baking together. I was thrilled when she responded that she would love to meet up with me! Unfortunately, it took a long time for our schedules to match up, but we finally made it happen this past weekend! Now, here’s the part where I explain how the savory recipe fits into the mix. We had originally planned to meet and bake on Saturday morning, but a few days ahead of time, I realized that I wasn’t free until the afternoon. When I emailed Julie to tell her that fact, she said that it actually worked out well for her! She had scheduled a sponsored blog post for Town House crackers and was going to be making dip to go with them, so she told me that I should make one, too! When I’m asked to make a dip, there’s only one possibility, and that’s the spinach artichoke dip I’ve been making since senior year of college. 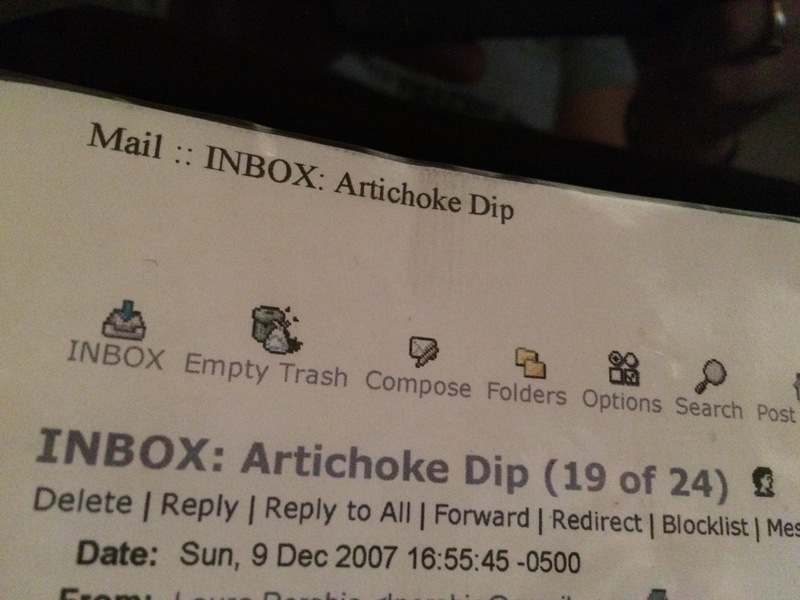 The printout of this recipe is directly from my college email (go UMass!) courtesy of my friend Laura. I no longer remember the occasion on which this recipe was first made, but it became one of my signature dishes a month later, when I made it for a party at my parents’ house and got rave reviews. I love this recipe because it’s simple and delicious, and it does not have mayo in it like a lot of similar recipes. 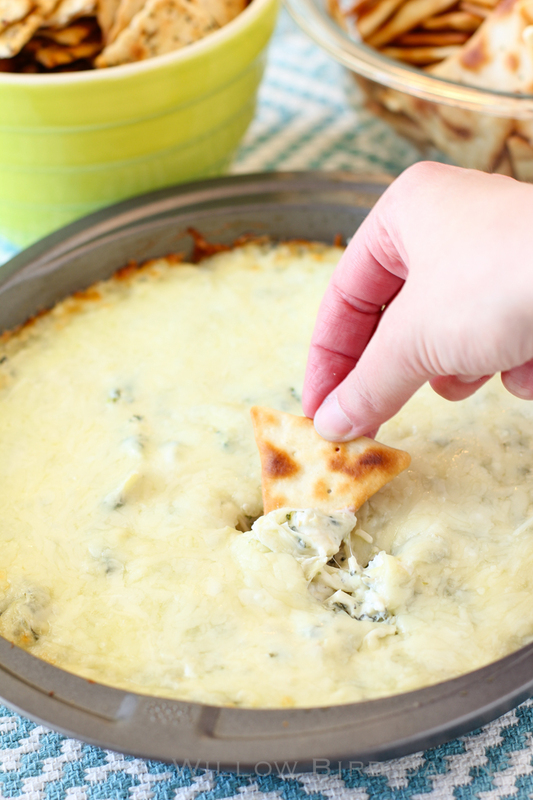 I will never make another cheesy spinach dip, and I bet you won’t either! I have even made a vegan version. Preheat the oven to 350 degrees and lightly grease a small baking dish. I usually use a 9-inch cake pan. In a medium bowl, mix together cream cheese, sour cream, parmesan, garlic, basil, salt, and pepper. Stir in artichoke hearts and spinach. Transfer the mixture to the prepared dish and top with mozzarella cheese. I always make sure every bit of dip is covered! Bake 20-25 minutes, until bubbly and lightly browned. 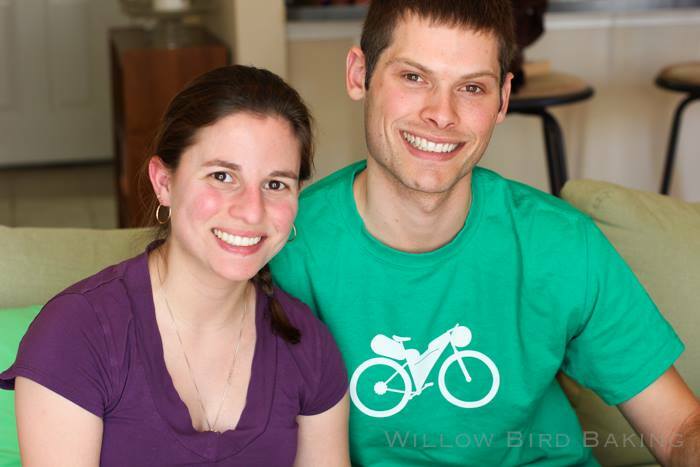 In case you wondered what my husband and I look like – Julie also got this cute shot! What’s your go-to party dish?